I’m back! I’ve been busy with my family lifestyle blog and have neglected this one. I’m sorry. I miss sharing sweet treats with you so I’m making an effort with a brand new logo and some new recipes to share. First up I’ve got this easy white hot chocolate recipe. Have you ever made a homemade hot chocolate before? What about a homemade white hot chocolate recipe? It might be less common but let me tell you, this recipes is every bit as good as traditional hot chocolate. I encourage you to expand your hot chocolate recipe collection with this indulgent white chocolate version! 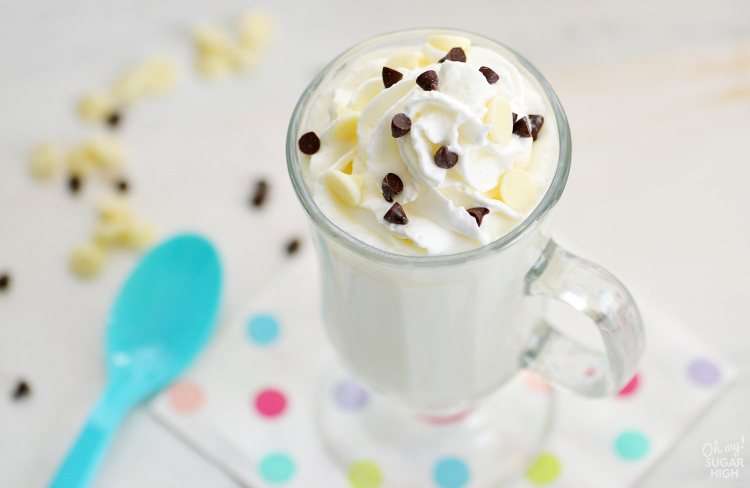 To make this white chocolate hot chocolate recipe, you’ll need white chocolate of course. I really believe with any hot chocolate that quality ingredients make for the best results. While you could go with any old brand, I personally love Ghiradelli. I’m not being paid to say that. It is really my favorite. This brand is readily available nationwide and a good quality chocolate without being too expensive. Whatever brand you go with, make sure it states “cocoa butter” in the ingredients list. Unfortunately a lot of the regular baking chips have no actual cocoa butter in them at all, including the Ghiradelli baking chips so look for the actual baking bar for the best results. Note: I have used the white baking chips and it still produces a pretty tasty drink so in a pinch you could use them. My white hot chocolate uses equal parts milk and half-and-half. It makes this drink richer and creamier but this can be made with just milk if you prefer. I add a pinch of salt to bring out the taste of the chocolate but that can be skipped. To make this recipe you’ll just need to add all ingredients to a small pot and cook over a medium low heat, stirring often. You want to get to the point where your hot chocolate is starting to steam but make sure you do not boil. For me no hot chocolate recipe is complete without some whipped cream. I added white baking chips and mini chocolate chips to mine but marshmallows or sprinkles would also be fun. 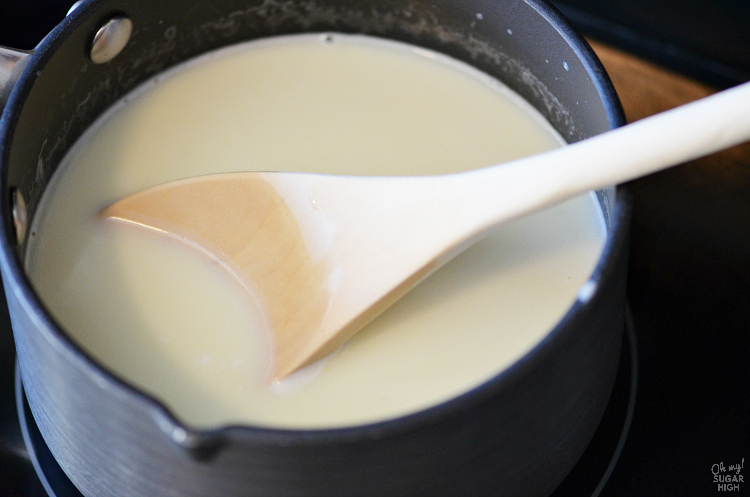 Once white chocolate is fully melted and mixture is hot, remove from heat. 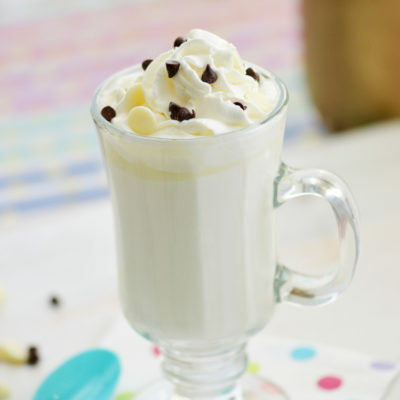 Pour into mugs and top with whipped cream and additional chocolate chips, if desired. 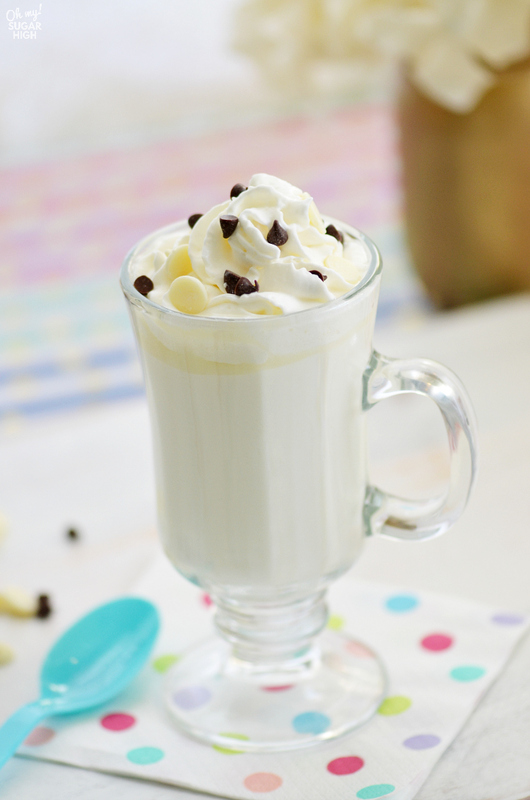 Even my husband who is a bit picky with his sweet treats loved this white hot chocolate recipe. I hope you do too. If you find it too sweet, add a little extra milk to cut it down. 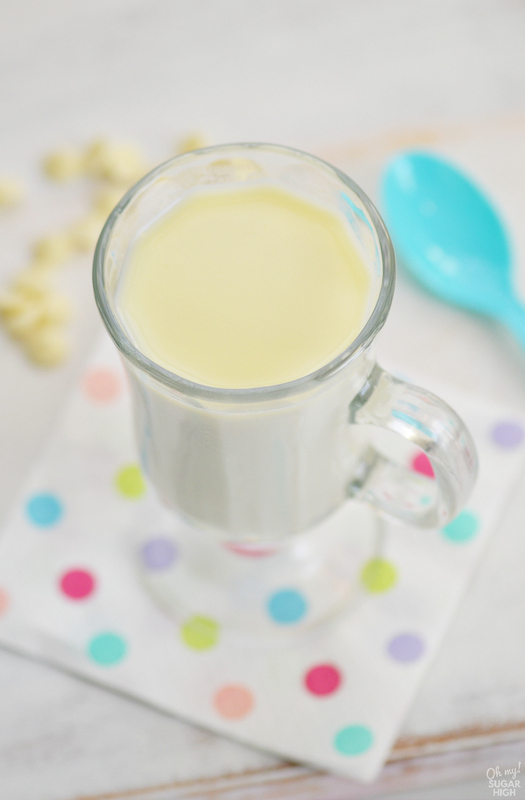 Give this easy white hot chocolate recipe a try and let me know what you think! Oh my gosh! This recipe tastes just as heavenly as it looks. As far as I’m concerned this is an essential hot chocolate recipe. I’m making this again tonight. Yum, yum! I’ve never thought of using white chocolate for hot chocolate, but how pretty! Love this!